93% of financial institutions agree that finding innovative ways to provide value-added services to customers based on data-driven insight will be “crucial to their long-term success.” (source: The Financial Brand). 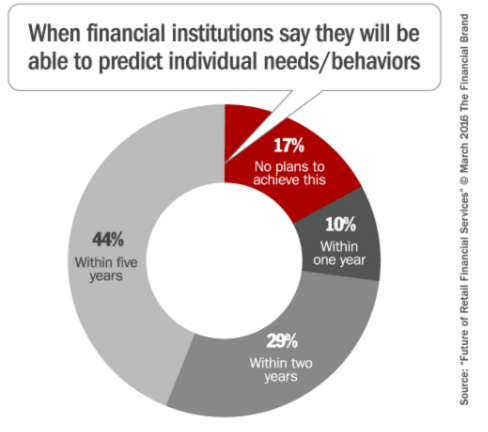 Furthermore, 83% say they hope to be able to predict needs and preferences on an individual basis within five years. The themes driving the adoption of personalized customer experiences are well rehearsed. Fast changing expectations of consumers, competitive pressures driving the need for higher customer satisfaction and loyalty, opportunities to cross sell more effectively and the potential to reduce costs and protect profitability. Yet today the speed of adoption remains modest due to a variety of key challenges, with too many financial institutions still deploying basic customer segmentation and delivering experiences that are below par in the digital age. Emboldened by anytime access to the internet via smartphones, tablets etc, and with instant access to product, pricing, comparison information, the behaviour and expectations of Digital Consumers’ are radically different to their predecessor. Digital Consumers have high, and ever increasing expectations of the customer experience they expect from companies, and how they want to be engaged. These consumers expect timely and relevant engagement. As a result, a one-size fits all approach to engaging audiences, or even broad segmentation, will soon be defunct. They are also fickle and easily disillusioned, as digital innovators such as Uber and Amazon raise the bar in terms of minimum customer expectations. Consumers financial needs remain mostly constant eg. paying bills, accessing credit, planning for retirement. However, their dependence on traditional providers is broken, with digital consumers able to cherry-pick the services they want from an array of options, with traditional providers competing with more social, innovative and digitally-savvy new entrants. In our recent blog article looking at personalization trends in retail, we evaluated the increasing power of consumers to define the types of content, engagement, and experiences they want from brands, and their willingness to penalise companies that won’t or can’t provide a more personalized experience. One key observation was that consumers value and want more personalization but aren’t yet united in the types of personal information they are comfortable disclosing and which personalization tactics from brands are acceptable. This sensitivity is amplified when it comes to financial services. Fears about digital privacy and security are heightened when dealing with personal finances compared to booking a holiday or purchasing an item of clothing online. A study of 2,300 global consumers who use online banking or insurance products (source: Mindtree) indicated 42% are concerned with online payment and fraud and 37% are concerned with privacy and security. These percentages are significantly higher when compared with customers asked about these issues in the retail, entertainment and travel industries. What seems certain is that increasingly consumers will penalise companies that don’t provide relevant and consistent experiences. It’s therefore a challenge for banks and insurance companies to embrace personalization using a sensitive and highly responsive approach, whereby new personalization approaches are carefully tested and refined to ensure the balance between customer trust and evolving expectations are effectively managed. The banking industry's early embrace of IT and myriad of mergers and acquisitions over recent decades means that technology investment that once represented a major barrier to competition is now increasingly a millstone around the neck for companies. Many banking legacy systems are clunky and incompatible with newer technology. They’re also complex and unwieldy as a result of years of ad hoc development and bolting on third party technology. This represents a significant cost and time investment for banks. Effectively pulling together disparate data sources to create a single view of the customer, a critical step in supporting personalization, is a major challenge for the industry with data held in departmental silos or associated with disparate products. 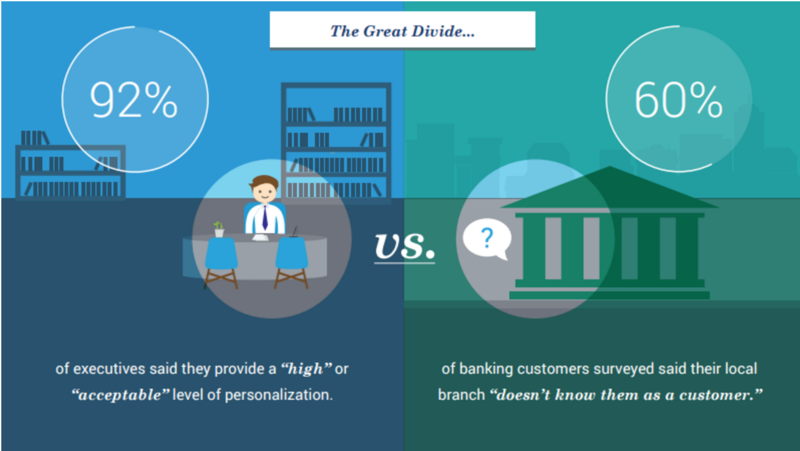 In a recent survey of bank executives, 85% said a lack of single customer view undermines their efforts to personalize. In addition to tackling legacy systems and data integration, many companies are not confident they have found the right technology to support personalization. A study of marketers in the US undertaken in Feb 2016 found 59% said they do not personalize content because they don’t have the technology to do so. 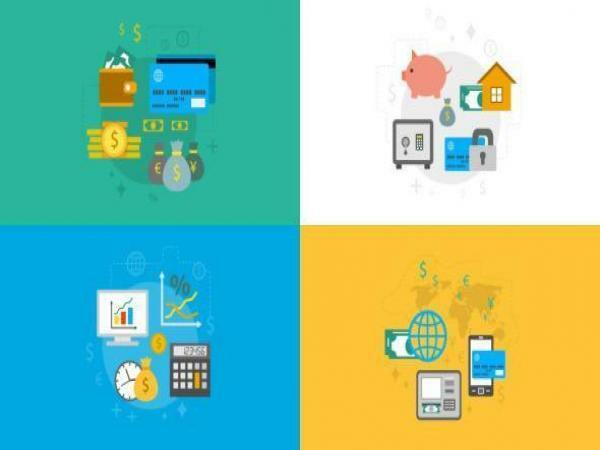 The Financial Services industry may have been late to feel the disruptive forces of the digital age, but are now front and centre. Agile new fintech companies are leveraging low cost cloud technology and innovative niche propositions to cut across the traditional value chain and threaten incumbents like never before. Quicker loan approvals, lower fees, low interest, simple mobile app based transaction journeys, all erode income for traditional firms. The emergence and rapid evolution in expectations of ‘digital consumers’ represents a major challenge to traditional banks. Business and operating models that have been stable and lucrative for decades require radical overhauls, whilst IT infrastructure investment, that once represented a barrier to competitors, has become a costly and complex impediment to effective change. However, traditional banks do have substantial customer bases with long standing customer relationships, and the race is now on to focus on those relationships and customer experiences to sustain success, defend profitability and fight off new market entrants. Clearly banks have to better align with both the expectations and current sentiment of customers. One key way to achieve that will be by effectively bringing together data to create a single view of the customer and using that intelligence to deliver relevant and consist personalization across products, services, marketing content and the user experience. You can also read our old post about key benefits of personalized user experience. Banks and insurance companies are in a race against time and more agile competitors, to align their brand and customer experiences with today’s digital consumer. The stake are considerable, from capturing billions of dollars in potential sales growth, protecting profit margins and fighting off substantial competitive threats. The road to success is complex and challenging, requiring financial services companies to become more agile and innovate. Knexus platform helps banks and insurance companies to deliver optimum, personalized content experiences using a powerful content matching engine. The engine searches a brand's relevant content (across multiple systems) to match with user data (eg CRM, transaction history, social behaviour) collected from a variety of sources. Delivery can be fully automated or manual.